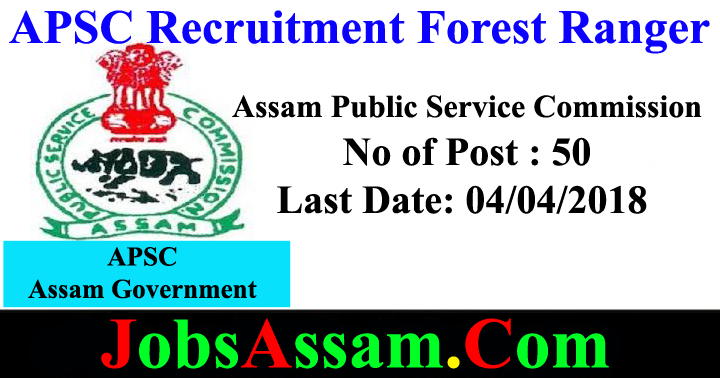 The Assam Public Service Commission invites Application from Indian citizens as defined in Articles 5-8 of the Constitution of India for filling up 50 (fifty) nos. 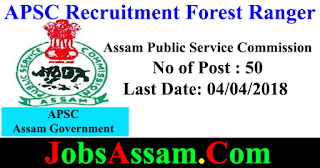 posts of Forest Rangers in the Assam Forest Service under Environment & Forests Deptt., Assam. Age: Candidate must not be less than 21 years or more than 43 years of age on the 1st January, 2018.The upper age limit will be relaxed in the case of Scheduled caste/ Scheduled Tribes candidates upto 5 (five) years as per rules. i. Original Treasury Receipt for Rs.250/- (Rs 150/-for SC/ ST/ OBC/ MOBC candidates) as Application fee showing the name of the post and deptt. and also full Head of Account “ Non tax Revenue, OTHER NON TAX REVENUE 0051 PSC, 105 STATE PSC Application fee receipt of Assam Public Service Commission”. ii. 2 (two) copies of recent passport size photograph duly signed by the candidate. iii. Certificate of age issued by respective Boards in HSLC or equivalent examination (self attested copy). iv. Certificates and Marksheets of all educational qualification from HSLC onwards (self attested copies). v. Caste certificate for candidates belonging to SC/STP/STH/OBC/MOBC from the appropriate authorities (self attested copy). vi. Experience certificate (where necessary) indicating the period of Service/ experience with date.